At the end of many baking projects, I find myself with leftover nuts and dried fruits. This homemade granola is a perfect way to use up whatever you have on hand and create a terrific granola to serve with milk or even over greek yogurt. The recipe calls for cashews and almonds but I used pecans and hazelnuts. I also switched out the raisins for dried cranberries. I also limited the dark brown sugar and the maple syrup to 1/4 cup each as I don’t care for overly sweet granola, and added in a teaspoon of vanilla extract and a teaspoon or two of ground cinnamon for a little extra flavor. This granola is so delicious and easy to make, once you try it you probably won’t ever buy the pre-made stuff again! You can find the basic recipe here. Start by lining two baking sheets with parchment or silpats. Set aside. Preheat oven to 250 degrees. In a large bowl combine the oats, nuts, coconut, dark brown sugar and a teaspoon or two of cinnamon (if using). Set aside. In a glass measuring cup whisk together the maple syrup, oil, salt and vanilla extract (if using). Pour over the oat mixture and mix well to combine. Divide between the two baking sheets and spread into a thin, even layer. Cook for 1 hour and 15 minutes, stirring every 15 to 18 minutes. 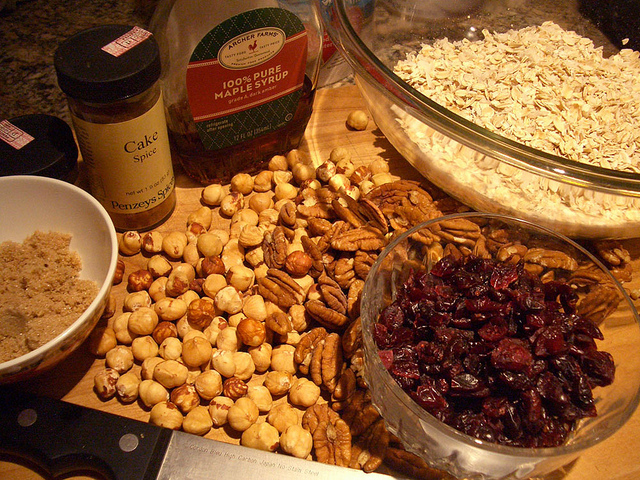 Let granola cool on the sheets then transfer to a bowl and mix in the raisins or dried cranberries if using. Serve with milk or sprinkle over greek yogurt. Store granola in an airtight container.